I have to admit that I was a bit skeptical about the changes to the Illustrated Faith monthly kit, Persevere. When I received my kit in the mail, I wasn’t exactly sure where to start. I looked over each piece and read through the devotional cards. As someone who likes structure, it was a bit daunting to not have the devotional booklet anymore. Today I actually had a chance to sit down and journal using the kit, and I had my “aha” moment for how I’m going to use it. I have to say that I think this new kit is really going to appeal to my personal style of journaling and give me the freedom to pursue other studies throughout the month in addition to working through the Persevere Kit. 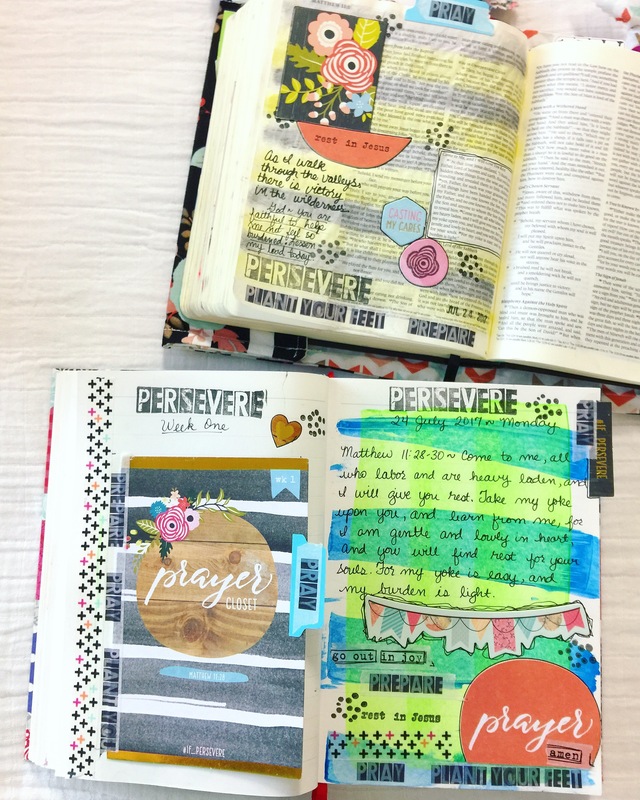 It took me a long time to create my first page in my Bible and my journal using Persevere, but now that I’ve done one day, I’m ready to share my review, as well as some ideas for how I will be working through it. I am finding myself gaining more and more excitement about the new format of the Persevere Kit, and I hope you will join me! Click here to purchase your own kit, and continue reading more below. First, I want to give you an idea for the content inside the kit. You can also watch my unboxing video here on my YouTube channel to see more. The things that remain the same in the kit are: a full roll of washi tape, a welcome note card from Shanna Noel, and a stamp set. The stamps are a smaller 3×4 size, but still have plenty of variety for journaling. The things that are new: die cuts that are already cut for you, heart shaped tip-ins, journaling/devotional cards, thinner stickers, and a smaller string-tie envelope. 4 cardstock devotional cards and 4 cardstock journaling cards replace the 14-day devotional booklet of the past kits. Although I like having the structure of a guided study guide, I personally struggled with sustaining momentum for all 14 days. I was also torn about what to do with the notebooks once I was finished with them, because I normally keep just one big journal, and having a bunch of little journals made me feel disorganized. I like to use a blank journal in addition to my journaling Bible, and I don’t really like having too many different notebooks/journals/bibles to keep track of. Now with the journaling cards, I have the freedom to use whatever journal I prefer. I think this will appeal to many people who, like me, prefer a certain type of journal/notebook/binder/planner/bible. You can just add the cards to your favorite journal, rather than using a journal provided for you. I’m really in love with the floral designs of the stamps and scattered throughout the kit, as well as the gold foil accents everywhere. The quality of the products is amazing considering it’s only $20 for the whole thing! A lower price point is definitely very appealing to me, since we live on a tight budget and the old price point was often out of reach for me to participate monthly. I’ve grown really fond of ways to make Bible journaling a bit easier and faster since I often have to squeeze my time in during naptime or after my babies go to bed, so having lots of paper pieces already cut for me is so great. There is a generous amount of die cuts included that match the style of the kit. I especially like that there are extra verse references on some of the smaller die cuts to also encourage more journaling ideas. Another way to make journaling a bit easier is lots of stickers! They are all so pretty that I had a hard time using a few in my first day of journaling, because I want to make them last. I like that there are more tab options and they are also bigger than the previous kit’s cardstock sticker tabs. I also like that most of these stickers are fairly small, so that means a lot more to go around. As I mentioned above, I finally had my aha moment of how I’m going to use the Persevere kit. The great thing about it is, you can use the kit in your own unique way, and I’ve already seen some great ideas from others! My plan is to use 1 devotional card and 1 journaling card per week, so 2 journaling entries per week for a total of 8 entries in the month. I usually start to wane after about 7 or 8 days in past devotionals, so I thought this was a good plan for me. I will also be using the cards in my blank journal as a way to write out some more lengthy prayers than I would typically put in my bible as well as do some scripture writing based on the verses provided. I then will use the other embellishments and stamps to journal the verse on the card in my Bible. If the card doesn’t have a verse, then that’s where the verses on the paper pieces can come in. I’m really excited to journal through this kit now that I’ve had time to process the change and think through how I’m going to use the pieces to fit my personal style. There’s not just one right way to use the Persevere kit, and I love that the redesign seems to have allowed for more room for creativity and individuality while still working through it together as a community. To purchase your own Persevere kit, click here. I will be doing at least one process video, so make sure you subscribe to my YouTube channel here. If you have any questions, leave a comment below and I would be happy to answer them! Please note post contains affiliate links. I receive a small commission for sharing products I love to use at no additional cost to you when you purchase through the link. I was given a Persevere kit from Dayspring in exchange for my honest review.